Boca Raton, Fl – Like their human counterparts on athletic fields and playgrounds, a growing number of pets are playing better with the help of synthetic turf surfaces. 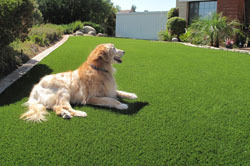 The Synthetic Turf Council reports that nationwide, leading dog parks, Dog Kennels, day camps, training facilities and Dog hotels have installed synthetic grass to provide a better experience for Fido that also benefits the environment. Collectively, the use of synthetic turf across the country saves billions of gallons of water each year. Pet facilities with the surface are being recognized for their environmental stewardship, like the Animal Community Center in Silicon Valley in Silicon Valley. It recently became the first Humane Society facility in America to achieve Gold Leadership in Energy and Environmental Design (LEED) project from the U.S. Green Building Council. The installation of 30,000 square feet of synthetic turf from Heavenly Greens significantly contributed to the facility’s certification, as it eliminated the need for lawn fertilizers, reduced water consumption and enhanced sanitation. Running, playing fetch and jumping by even one large dog can take its toll on grass. As a dog day camp, dozens of dogs use a play space throughout the day, seven days a week. Just ask ForeverLawn, who has served intense usage facilities like the Central Park Dog Park in Fremont, Calif., a 40,000 square foot dog park that is the largest of its kind in the country. When other parks are closing down during the winter months for maintenance, or sending dogs back to their cars covered in dirt and mud, the synthetic grass at Central Park Dog Park allows it to remain open, and mud-free, regardless of the weather. Conveniently located adjacent to Chicago’s O’Hare Airport, Paradise 4 Paws offers 24-hour access and often cares for the pets of busy business travelers. With its large indoor synthetic turf play area is packed both day and night, the dense construction of synthetic blades supports the demands of pets’ intense play. Lounging by the pool takes on a new meaning when your puppy can enjoy state-of-the-art play areas made safer and more sanitary with synthetic grass. Splash pads and pools are proving to encourage longer and more creative play among dogs without the muddy mess, such as the one at Morris Animal Inn in Morristown, NJ. It features a pool surrounded by specially designed synthetic turf as well as a whirlpool with eight adjustable jets. The turf drains excess water from the pool as well as animal urine, keeping the area as clean as possible.